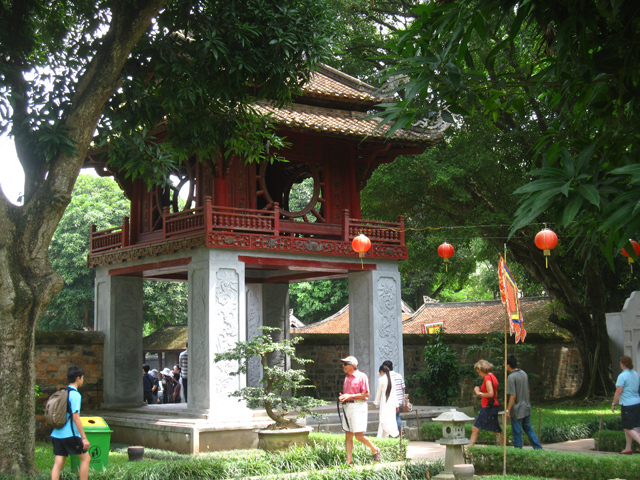 Hanoi is the capital, and one of the most popular cities to visit in Vietnam. The Temple of Literature, an ancient complex that is both a temple and an academy, is one of the most famous attractions and places of history the city has to offer. It's a temple dedicated to Confucius, meaning that it's a place where scholars and students formerly lived and studied. Beginning in 1076, the imperial academy opened and began to enroll students. The Temple of Literature is neatly organized in a series of courtyards, each courtyard leading further and further into the temple and finally to an area that housed shrines and many statues including one of Confucius himself (see below). The construction is based on the temple in China where Confucius was born. 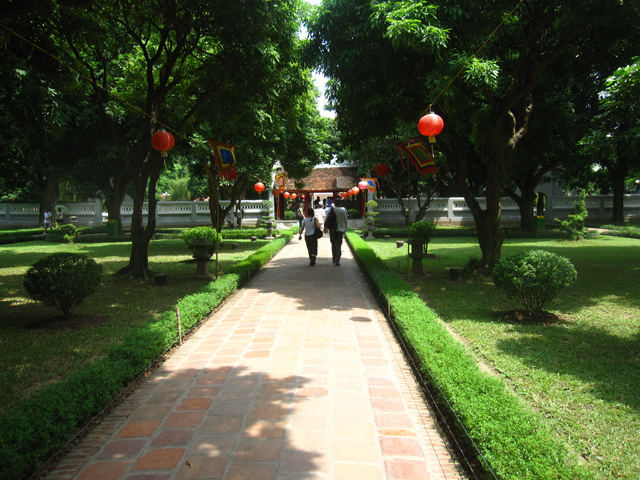 The grounds of the temple are lush and green with big beautiful trees and gardens. You can browse around all the courtyards at your own pace. I enjoyed looking at the stone steles which are all lined up under an awning when you enter the complex. Known as the Stelae of Doctors, there are 82 (though there were formerly 116) of these stone engravings which have a turtle as a foundation. The steles were created as a way to encourage students to pursue knowledge and to continue learning. 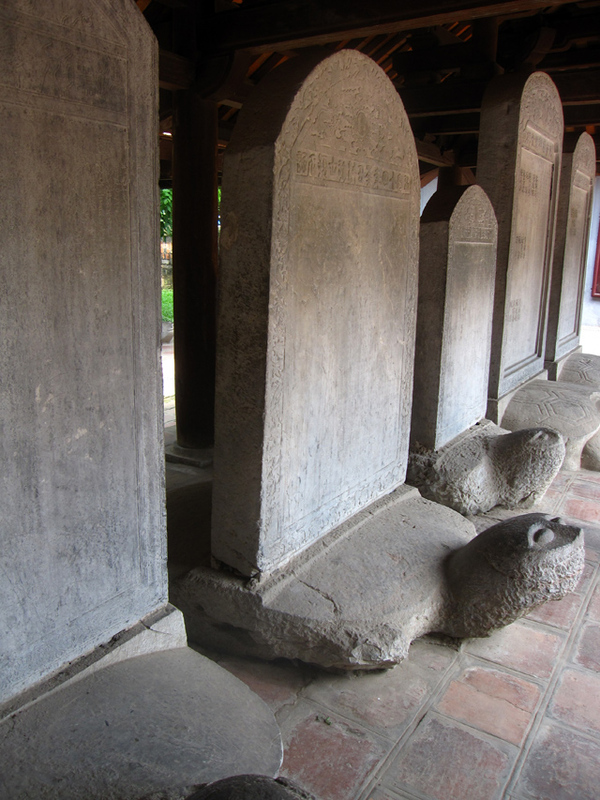 The Chinese writings on these stones steles have been a significant source of information into the past lives and culture of Vietnam nearly 1000 years ago. These steles also include information about students and those who graduated from the academy. In the fourth of five courtyards is where the main temple is located. On either side of the main shrine there are two halls that were used to honor some of the most faithful Confucian followers. At the front of the courtyard, surrounded by statues and burning incense was the elaborate statue of Confucius himself. 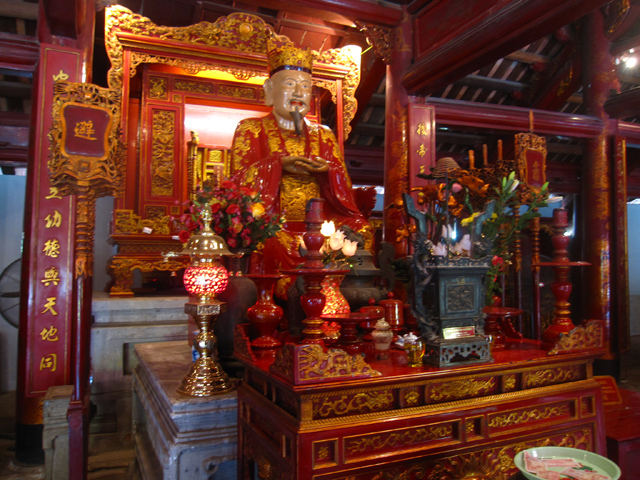 As a Confucian temple, Confucius was not only studied, but also worshipped at this temple. Just outside of the main shrine were some cabinet displays of old clothes, pens, notebooks, and a few small personal belongings from students who had attended the imperial academy. Like any historical site that I visit, while I enjoy the overall attraction, I really like to pay attention to the small details. It's the small things that can really make a place stand out and be worth visiting. The Temple of Literature is packed with symbols and details that are easy to miss, but if you look in the right places, they can make the experience more rewarding. 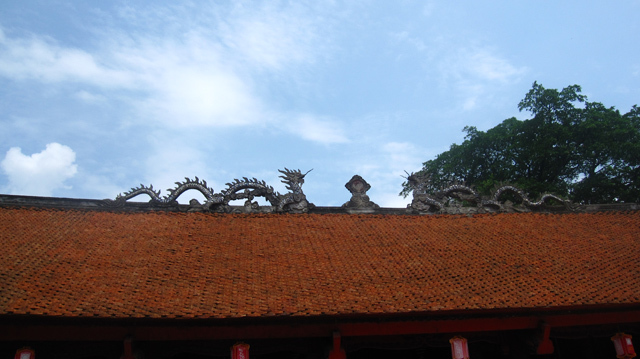 The dragons on top of the roof carved from stone are in place according Feng shui and give the building protection, not so much from human enemies, but from natural things like fires and other devastating disasters. After spending a few hours walking around the Temple of Literature, we were quite hungry. Luckily after just a few moments of searching I located a local restaurants serving Vietnamese noodles. 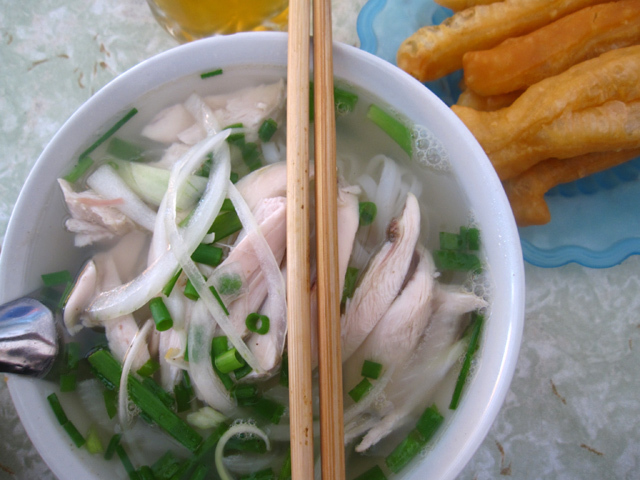 It didn't take long before I was seated in front of a piping hot bowl of chicken pho and ready to dig in! 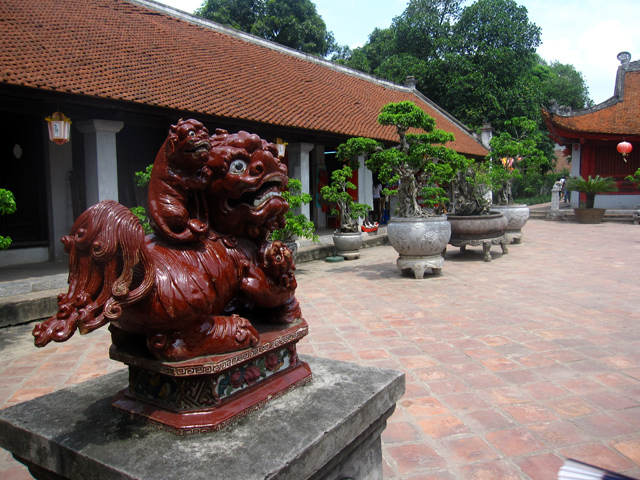 Be sure to include the Temple of Literature on your tour of Hanoi. Completely missed this while I was in Hanoi, but now that I think about it, I also didn’t visit any temples in the Vietnamese capital. Looks like a great place for a stroll. My highlight at the temple was the hawker out front attempting to sell t-shirts next to a sign that read something along the lines of: No selling allowed. Right across the street from the back of the temple is the art museum, which is really worth a visit. Many of the works depict the war from the Vietnamese artist’s perspective. It was the most interesting propaganda I had seen among all the museums. I wanted to visit Vietnam next year and Hanoi will be my first destination. I’m going to visit the Temple as well and try all Vietnamese food. Gosh it looks so beautiful, peaceful and spiritual! Thanks for the lovely post!